General Conditions of Purchasing | VerMoTec - Nr. 1 in der Löttechnik - weltweit! Worldwide the No. 1 choice in automatic soldering and brazing! services and automation concepts from Vermotec. (1) Place of Performance for both parties and exclusive Court of Jurisdiction for any litigation resulting from the contractual relations is 66386 St. Ingbert/Germany. (2) The contracts concluded between the supplier and us are subject to the Law of the Federal Republic of Germany but excluding the United Nations Convention on Contracts for the International Sale of Goods (CISG). (1) All deliveries, services and offers of our suppliers are effected exclusively based on these General Conditions of Purchasing; no other, different conditions will apply. These conditions are an integral part of all contracts we conclude with our suppliers on the deliveries or services they offer. They also apply to all future deliveries, services or offers to the customer and do not need to be separately agreed upon. (2) The general terms and conditions of our suppliers or third parties will not apply, even if we do not discount their validity in an individual case. Even if we refer to correspondence, which contains or refers to terms and conditions of the supplier or a third party, this will not be understood as our consent to the validity of such terms. (1) The price stated in the order is binding. 2) In the absence of a written agreement stating anything different, the price contains delivery and the transport to the delivery address mentioned in the contract, including packing. (3) If as per agreement, the price does not include packing and the price of the packing material (if it has not been made available as a lean) is not clearly stated, the packing material charge will be the verifiable cost price. On our request, the supplier has to take back the packing material at their expense. (4) Unless something different is agreed, we will pay the purchase price within 14 days from the delivery of the goods and after invoice receipt with 3% discount or within 30 days net. (5) Our order number, item number, delivery quantity and delivery address must be stated on all order confirmations, delivery notes and invoices. If one or several of these items is/are missing and therefore processing within our normal business operations is delayed, the payment times mentioned in par. (4) will be extended by such time of delay. (6) In case of default of payment we will owe default interest of 5 percentage points over the base interest rate as per §247 BGB (German Civil Code). (1) The delivery time (delivery date or time) stated in the order is binding. Early deliveries are not permitted. (2) The supplier has the obligation to inform us without any delay and in writing if circumstances arise or become apparent which would make it impossible to meet the delivery date. (3) If the latest day of delivery can be determined by contract, the delivery will be considered late that latest day without the need of a reminder on our behalf. (4) In case of a delayed delivery we are entitled to the full extent of lawful claims, including the right to withdraw the order and the claim to damages instead of the delivery or service after the unsuccessful expiration of an appropriate grace period. (5) In case of a delayed delivery and after a prior written warning to the supplier we are authorized to demand a contractual penalty in the amount of 1% for every commenced week of default but not exceeding 10% of the order value. The contractual penalty is to be imputed on the damage caused by the delay, which the supplier must reimburse. (6) The supplier is not authorized to make partial deliveries. (7) The risk will only pass over to us at the time the goods are handed over to us at the agreed destination, even if shipment has been agreed. (1) We reserve the right of ownership or copyright on all orders, contracts as well as drawings, images, calculations, descriptions and other documentation made available to the supplier. The supplier is not authorized to make them accessible to third parties or publish, use himself or have used through third parties or copy without our expressed consent. On our request, the supplier must return these documents and possibly made copies completely to us when they are no longer needed for proper business process or when negotiations do not lead to the conclusion of a contract. (2) Any tools, fixtures and models which we make available to the supplier or which have been manufactured for the purpose of the contract and which the supplier has charged us for separately, will remain our property or will pass to our property. The supplier must label them as our property, store them diligently, secure them from damage of any kind and may only use them for the purpose of the contract. The cost of the maintenance and repair of such items will be borne by both partners – unless otherwise agreed – at equal shares. However, if such costs iare attributable to the damage to items manufactured by the supplier or to the improper use of the items by the supplier, his employees or other agents, such cost will be borne solely by the supplier. The supplier will inform us immediately about all non-negligible damage to such items. The supplier is liable to give to us such items in proper condition when they are no longer needed for the fulfilling of all contracts concluded with us. (3) The supplier’s reservation of ownership only applies to our obligation to pay for the products, which he reserves ownership for. In particular, extended or expanded reservations of ownership are not admissible. (1) In case of technical defects we have the right to exercise all lawful claims. Apart from this, the warranty period is 36 months. (2) Our communication of quality and quantity deviations to the supplier within 14 business days from the date of our reception of the goods shall be considered sufficient notice. Our communication of hidden material defects to the supplier within 14 business days from the date of their discovery shall also be considered sufficient notice. (3) Our acceptance or approval of any samples presented does not imply our waiver of any warranty claims. (4) The supplier’s reception of our written notification of any defect will suspend the period of limitation of our warranty claims. With the delivery of substitute products and elimination of the defects the warranty period for any replaced and repaired parts will start anew, unless we had to assume from the supplier’s behavior that they did not see themselves liable to provide the measure but rather executed the replacement delivery or corrective measures solely for reasons of goodwill or similar reasons. (1) The supplier is liable for all claims made by third parties due to personal or material damage, which can be attributed to a defective product he delivered, and he is obligated to release us from any resulting liability. If we are obligated to conduct a recall due to a defect at a product delivered by the supplier, he will bear all expenses in connection with the recall. (2) The supplier is obligated to maintain at his own expense a product liability insurance with a minimum coverage of EUR 2,000,000, which, unless in an individual case something else was agreed on, does not need to cover the recall risk or punitive or similar damages. The supplier will send us a copy of the insurance policy at any time on our request. (1) The supplier will be responsible that no property rights of any third parties be infringed in connection with their delivery within the European Union, in North America or other countries where they manufacture the products or have them manufactured. (2) The supplier is obligated to release us from any claims, which third parties may raise due to a violation of industrial property rights mentioned in par. (1) and to reimburse all necessary expenses in connection with such claims. This claim persists independently from a fault on behalf of the supplier. (1) The supplier is obligated to provide spare parts for the products delivered to us for a period of at least 10 years after delivery. (2) If the supplier intends to stop the production of spare parts for the products delivered to us, he will notify us of such an intention immediately after the decision. Subject to par. (1), such a decision must be made at least 6 months prior to production stop. (3) In case of a production stop, we will have the unilateral right to purchase the stock or individual items of our choice from that stock; the products concerned by this purchase right will be sold to us at liquidation prices. (1) The supplier is obligated to keep secret the conditions of the order as well as any information and documentation made available to him (with the exception of publicly accessible information) for a period of 3 years after conclusion of the contract and to only use them for the execution of the order. Upon answering queries or completing orders they will immediately return them to us. (2) Without our prior written consent the supplier must not hint at our business relations nor exhibit any items produced for us and delivered to us. (3) The supplier will obligate his sub-suppliers accordingly as per this §10. The supplier is not authorized to transfer their claims deriving from the contract to third parties. This does not apply to monetary claims. 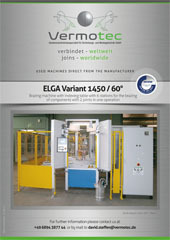 Speed up to Vermotec Quality! 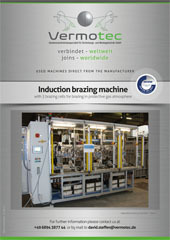 Worldwide the No.1 choice for automated brazing and soldering machines and service is Vermotec GmbH! This is because for more than forty years the research and development programmes that we have carried out has resulted in Vermotec GmbH becoming the world leader in the design, manufacturing, and the subsequent shop-floor use of our automated brazing and soldering production equipment and systems. The secret of our success is to be found in our philosophy of using the knowledge we have gained over the years from the design, manufacturing, and subsequent use of about 4000 machines that we have supplied to the both the home and export markets. This has enabled us to focus our efforts on the fundamentals of the brazing and soldering technology that inevitably lead to a technically and commercially viable automated system that meets the desired objective of the customer. Technically experienced engineers who are familiar with the finer points of technical consultancy and project planning in the techniques necessary to ensure that the primary objectives of a client are fully satisfied by the information that these engineers give when visiting the client or talking to him on the telephone. Consequently we are certain that it will be a wise move for you to to ask Vermotec GmbH to assist you with any new automated brazing and soldering systems that you need in order to meet the requirements of your existing or potentially new customers. We deliver our machines worldwide. The engagement and exchange in interdisciplinary associations and initiatives strengthens our eyes for future development. Furthermore, we are in constant dialog with international renowned specialists in the field of soldering in brazing technology – so called world experts – to guarantee the continuous development. Of course we have also been certified according to DIN EN ISO 9001:2015 and this since 1998. Since 2017 we have been certified according to the DIN EN ISO 14001 : 2015 environmental standard too.